That night was magical. While, it felt like entering a fort with its high walled security entry, the moon light on the bridge that runs through the property was truly magical. It was serene. The view of the pool from the bridge was intriguing. Like a blast from the past.....I mean well past, like a few civilisations past. The pool like the Harappa and Mohenjodaro pool. With the moonlight on it. Some things change for better, I guess. After a long long wait for the property to be up, the sprawling resort on ECR is up, but in a new avatar as the Intercontinental Chennai Mahabalipuram Resort. While not really a beach resort, the beach is walkable. The place has an intriguing feel because of the way it is built. It feels like it has too many characters. The lobby is eclectic. With straight stairs going up to the extremely well planned out bar with a spacious outdoor space, a royal indoor space and a modern side to it, the lobby and bar alone seemed to have multiple personalities. The rest of the hotel is even more confusing. Built around squares, it has a really ancient feel to the design but an extremely modern feel to the decor. The pond almost entirely covers one half and the swimming pool and garden form the other half, split by a walkway. The bridge is on top of the walkway. That night, courtesy the moonlight, it was magical, but I wonder how this place will look at daytime. I have to go back there to stay to find out. We were here for the food. What's so special in a resort's buffet, I thought. It wasn't the buffet. It was a 7 course meal. Who does that in the all day dining? Well, here they do. 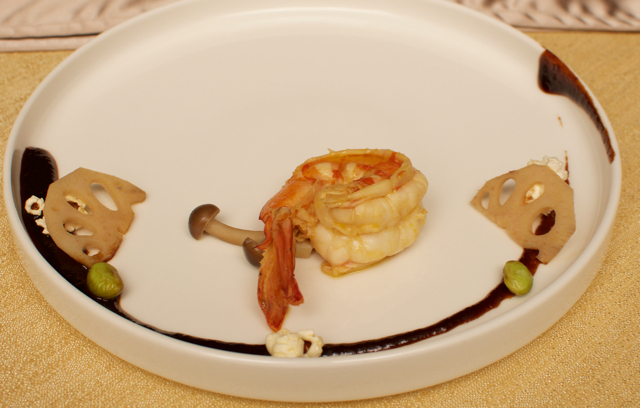 Aimed at those staying for long and don't want to do a buffet everyday and those willing to drive down from Chennai to celebrate a special occasion or to impress the woman of their lives (or hope to be), this was a showcase of Chef Ashish, who is here from Anandha, Himalayas. When I saw the words 'Ash potato' on the menu of the day, I was wondering why they didn't notice that mistake and was actually looking forward to the mashed potatoes. 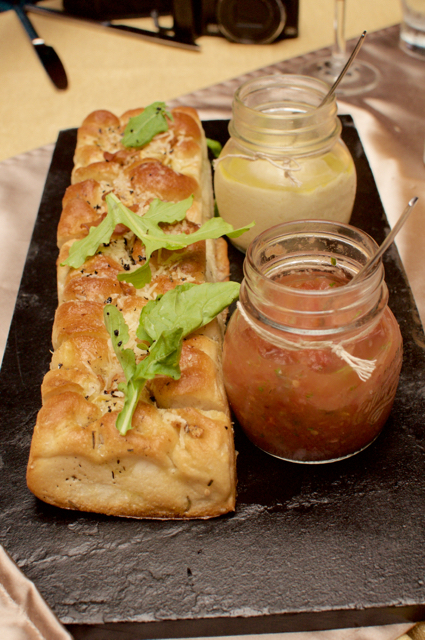 Freshly baked bread with the dips were so good, that we took refills all along the way. It looked great, it felt great and tasted excellent. This was followed by an amuse-bouche, a melange of vegetables. Then the excellent scallops and duck with cauliflower puree, but I am rushing to the next course, the soup. 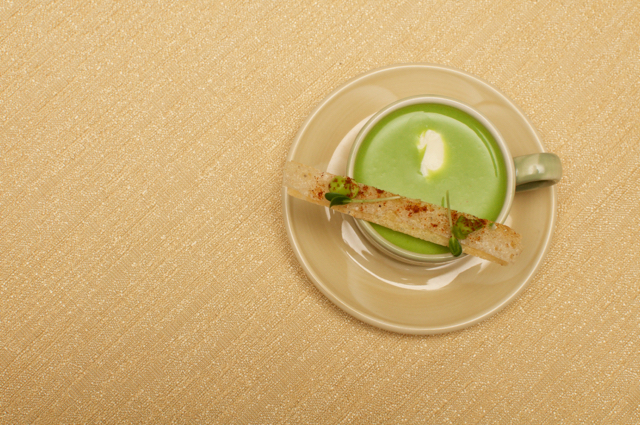 This was a green peas soup, full of flavour served in tiny coffee cups with a wafer of bread with parmesan. This was just fabulous! It was small enough to keep us wanting for more and reminded me of the mushroom cappuccino served in similar portions at a favourite restaurant of mine. This though, was a cold soup and that added to its complexity. Loved it. This was followed by an excellent prawn dish. Poached in orange juice with curried pop corns and miso, this was a melange of flavours. All familiar, but not together. The tinge of orange with the miso and the little bump of pop corn was excellent. 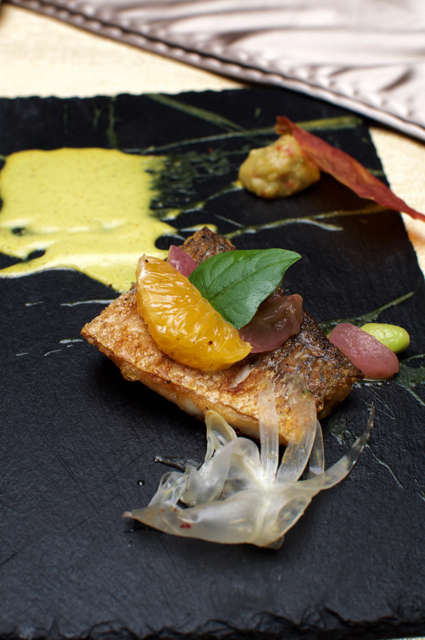 This was followed by the baby Sea Bass, with a citrus salad, that wasn't on my favourites' list. But then, I am not a big fish fan, so that opinion to be taken with a pinch of salt! This was followed by the spelling mistake. Tenderloin with potatoes, but there was no mashed potatoes. The chef came on to explain how he got the 'ash' on the potato. It was indeed Ash potato with the beef!!! Flummoxed! 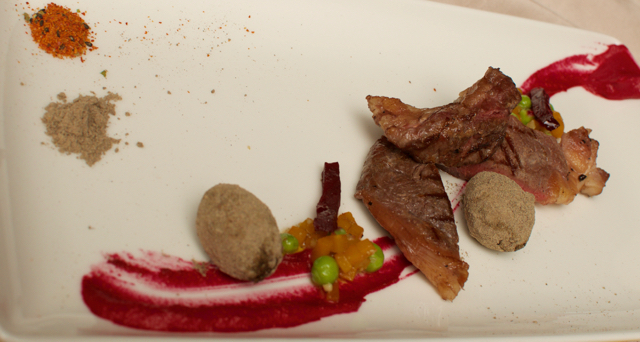 While I loved the potatoes and the beetroot puree and the beans, I didn't fancy the beef so much, that day! The next course, dessert more than made up for it. 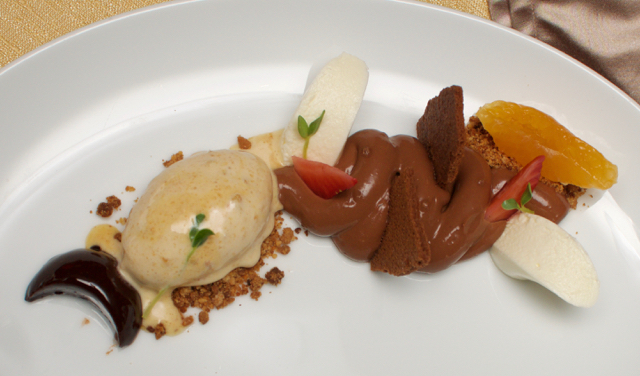 Five textures of chocolate with the fabulous banana ice cream was a feast for the eyes and palate. Buffet is priced at Rs. 1499 and 1799 plus taxes for lunch and dinner, while a 7 course meal like what we had is priced at Rs. 2500 plus taxes, with a few hours of advance notice. A friend said that their breakfast was excellent, but I am yet to try any other meal there. Waiting for the other restaurants to open and then plan a mini holiday there. Will update on how the stay and rooms are, real soon! Intercontinental Chennai Mahabalipuram Resort is on the way to Mahabs, about a dozen or so kilometres before Mahabs!